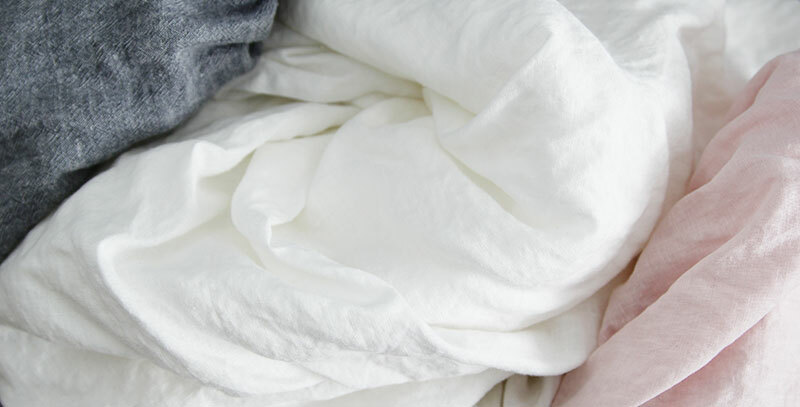 There’s something about freshly washed linen that’s a mood booster. 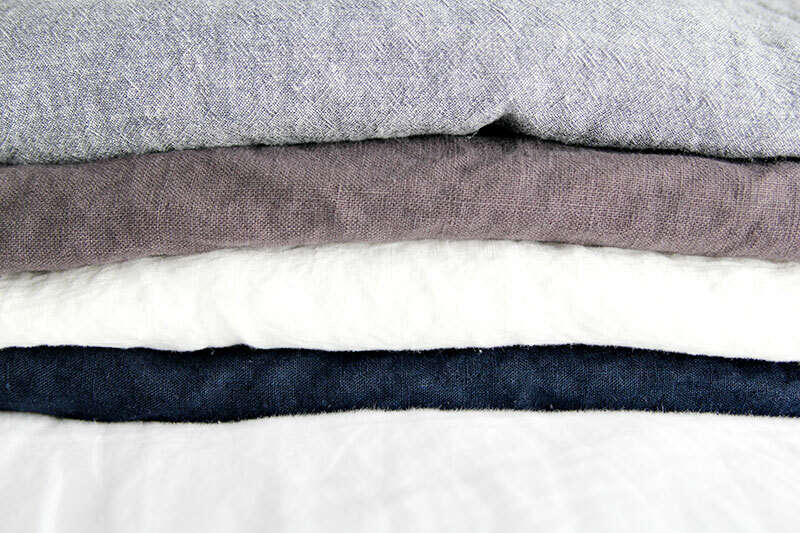 I’m talking about plain fabric here, and not fitted sheets or shams. Rumpled and textured and oh-so-soft, when I look at these, I pretend I live in the French countryside in a charming villa painted a dusty bleu-grey, overlooking fields of lavender. I can practically hear a baby goat bleating nearby. I have plans for these beauties. But because I’ve noticed that I categorically avoid making the things I declare as part of my plans (rather, it seems to take me longer to execute when I declare anything on the blog), I’m going to keep mum until I have something to show. But isn’t it nice just to look at the luscious linen? Doesn’t it make you want to toss the pile into a handwoven laundry basket and head outside to clip them to a clothesline (wooden pegs, of course) and watch them gently flap in the wind? No? Is it, in fact, making you shake your head that I obviously have nothing to say and am filling up the space with nonsense? Deadlines, people. I’m currently translating a Japanese craft book and I have to have it completed by next Tuesday. Whenever I’m in deadline mode, I need to let off some steam by adding something here. Makes me feel productive. More soon. Promise. In the meantime, I am dying to get my hands on these metallic linens from Purl Soho. Anyone sewn with these yet? I want every color, but so pricey! P.S. In case you’re wondering, the white and indigo linens are from District Fabric – at $8 per yard for 100% linen, it was a very good deal. The yarn-dyed pink cotton linen lawn (I know!) was from Miss Matatabi. I can’t remember where I got the other ones (here, probably), but they’re gorgeous. Oh, that metallic linen is divine! I keep thinking I will order some but will have to figure out what I will make first before splurging. I have a gift card that I can use so I feel less guilty paying for it. 🙂 Good luck with the deadline! Oooh, a gift certificate from Purl Soho is awesome! I like the totes they made out of the metallic linen but I’m thinking a triangle Eco bag would also look quite nice 😉 Thanks Daniela! Do-itashimashite, Karen(too lazy to switch to Japanese, sorry ?) it was SO fun to put together!! My Japanese roots come in handy when it comes to packaging! Oh all that yummy linen! It must be hard while you are heading for your deadline (good luck with that). I’m on a linen love roll at the moment and just cut out 4 tops! I haven’t tried the metallic linen yet. I’ve had to put sewing on hold for a bit, but it’s actually awesome to have this project. I love it! I’m looking forward to getting back into regular sewing though, it feels like it’s been too long! Thank you Melissa ? Someone else was telling me about Gray Line Linen. Metallic linen is always urgent and an emergency, no? 😉 Thanks for the offer, Delphine!! Oh my goodness, THANK YOU for posting the Purl Soho metallic linen link. I saw them somewhere else at one point, then promptly lost the link and forgot where I originally saw them. And all my Google searching was for naught. I want to dive into that pile!! I almost did, Morgan! If I wasn’t grubby, I just might have…. What a gorgeous pile! Simple and elegant and chic comes to mind. YES to everything about this post! I love freshly laundered fabric and linen just has a body of its own. So true, Em. 🙂 Linen is ethereal stuff!! Thank you, Grace! You’ll have to convince Tessuti to carry some metallic linen ;-).